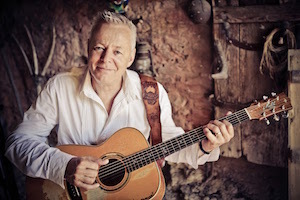 Two-time Grammy nominee Tommy Emmanuel, one of Australia's most respected guitarists, will once again bring his passionate and infectious live show to Smothers Theatre in Malibu on Wednesday, January 17, and Thursday, January 18, at 8 PM. Both shows will include performances by guitarist JD Simo. Emmanuel’s shows are part of his tour supporting his new duets album Accomplice One, set to release on Friday, January 19, via CGP Sounds and distributed by Thirty Tigers. The 16-track collaborative album features guest artists such as Jason Isbell, Mark Knopfler, Rodney Crowell, Jerry Douglas, Amanda Shires, Ricky Skaggs, and David Grisman, and includes a mix of new takes on indelible classics and brand new originals from Emmanuel and his collaborators. A world-renowned guitarist, songwriter, and singer, Emmanuel is known for his complex fingerstyle technique, energetic performances, and use of percussive effects on the guitar. With a musical repertoire that spans pop, jazz, blues, gospel, classical, flamenco, and aboriginal styles, his warm and soulful sound has won him hundreds of thousands of fans worldwide. His unusual talent and life are common lore in Australia. Born into a musical family, Emmanuel first started playing guitar at the age of four, and joined his family's touring band just two years later. Following high school, he became one of Australia’s most in-demand rock musicians, playing guitar in a succession of bands, including one of Australia’s best-known acts, Dragon. He supplemented that with a side job as a studio musician, playing on recordings for Air Supply and Men At Work, as well as thousands of commercial jingles and tunes. In the 1980s he embarked on a successful solo career, and has released over 30 studio albums, and continues to intersect with some of the finest musicians throughout the world. Emmanuel is one of only five musicians to hold the distinguished “Certified Guitar Player” (CGP) title from late music legend Chet Atkins. He has also received multiple awards by Guitar Player Magazine, and was appointed a Member of the Order of Australia, an honor bestowed by the Queen in his homeland. He received two Australian Recording Industry Association (ARIA) Awards (the Aussie equivalent of the Recording Academy), performed during the closing ceremony of the Olympic Games in Sydney, and has collaborated with Eric Clapton, Doc Watson, and John Denver. Simo is a guitarist and singer who began playing guitar when he was five years old. At the age of 15, Simo recorded his first live EP in Phoenix, Arizona, which sold 5,000 copies. He moved to Nashville, Tennessee in 2006, and joined the Don Kelley Band as the group’s lead guitarist. He also worked as an in-demand session musician. In 2010 Simo formed the band SIMO with bassist Frank Swart and drummer Adam Abrashoff. The group is currently on tour in support of their latest album, Rise & Shine. Tickets range between $10 and $55, and are required for attendance.